Win this app May 18th, 2016! My son loves Pancakes. His stomach is a bottomless pit when breakfast time comes. As I flip the hot cakes to golden brown perfection, he is licking his lips and pounding his utensils on the table. I thought it was just my son but it turns out, a lot of his friends love pancakes too. They don’t even need syrup. Children far and wide pound the table for pancakes. Since it is a favorite food for many, you can only imagine, the story, Pancake Pandemonium will be a favorite too. It’s been so much fun reviewing this story. The illustrations are grabbing and beautiful. They capture your attention right away. The story is whimsical and fun. It includes a lot of great sight words as well as rhyming words too. This app is probably best suited for children between the ages of 6-10 years of age. The words and sentence structure is a little advanced for toddlers and preschoolers but they might enjoy it as well. Pancake Pandemonium was written by Anita Pouroulis. It was illustrated by Tom Bonson. The Little Girl Narration is by Ella Osbourne and the Adult Narration is by Jacky Davis. Last, it was developed by Digital Leaf. Digital Leaf focuses on making stories come to life. They have developed various digital stories for children and they all look just as charming as this one. Let’s get started! When you open the app, you will see the option to “Begin Story”. Before you do that, click on the settings wheel at the bottom left corner. In the settings, you can choose to turn the narration on or off and to also choose an Adult or Child narrator for the story. One feature that was missing is the option to turn the music on or off. Obviously, you can mute the iPad or device at any time and get the same result but it’s a nice feature for kids to have access to. Hopefully that will come with a new update. Just like most digital stories, you can listen to the narration, look at the pictures, and follow along with the words. One really neat addition that makes this app unique however is the search for frying pans. If you find all of them, you can unlock a bonus game during the story. This is a fantastic reinforcer and will definitely motivate kids with low attention spans or those that struggle with reading. My son was so excited about finding all of the frying pans within the story that it really kept him reading and attentive. The illustrations are incredible. They are vibrant and full of small details. I would love to see a labeling feature where a child can click on certain objects and see the word labeled. It would be especially helpful for rhyming objects within the storys’ illustration. Kids that have speech delays but also all children can really benefit from a labeling feature. I loved the narration! The voices are “captivating”. Being able to choose between a child or adult narrator is genius. You have the option between two characters: Mary Whiperwill, an adult, and Emily Smipp, the child. I also love that the words are highlighted as they are read. The narration can be re-read if needed by simply clicking on the book icon in the upper left corner next to the home page. This 24 page story focusing on a lot of rhyming words. You will notice them over and over throughout out the story. The words are unique and fresh. It is a more advanced rhyming story but I think it is very age appropriate for a child that is 5 years or older. If your child wanders out of the story by clicking on the home page, it will save their place. Once they decide to continue, they can pick up the story where they left off. Any icons that aren’t directly related to continuing through the story can become a distraction at times for children on the Autism spectrum so I would love to see an option where the home button could be removed or locked during story time. Overall, I thought this story was clever and charming. 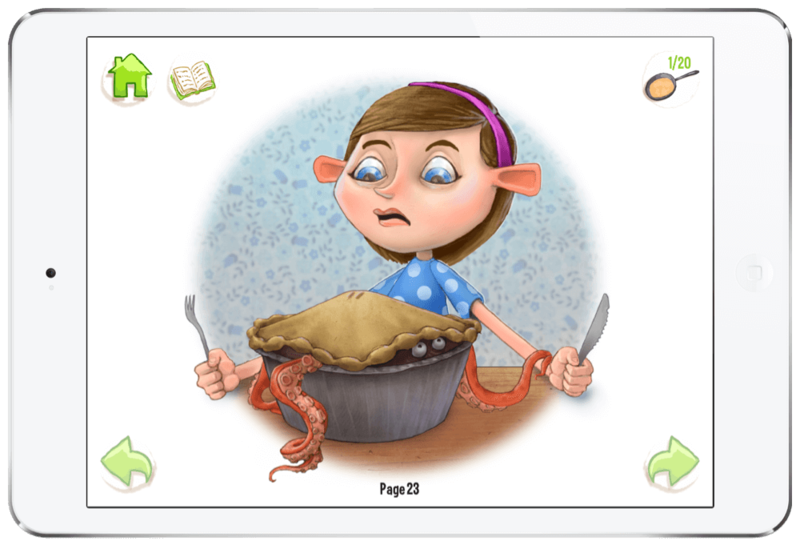 It is perfect for the pancake lover but will benefit all kids that need to work on rhyming, reading, and comprehension. It also is very funny. Both of my boys giggled their way through the entire story. 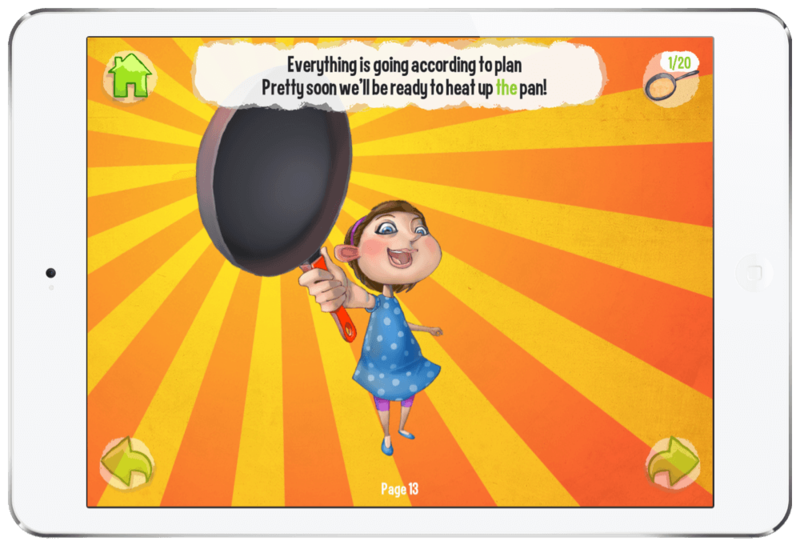 Finding the frying pans is the perfect bonus game to keep kids engaged and attentive. Incentives and games really help children with Autism, ADHD, to focus and remain motivated. Another important key to any app is safety. The app is very safe. I could not find any links outside or ads within the app at all. I loved the tips available in the settings menu. Users tend to like an introduction that is short and sweet but offers the basics for how to navigate the digital story. I would love to see a labeling feature within the story to make it even more interactive. I would also love to see an option in the settings for the home menu icon to be removed during the story. I have curious clicking children that like to go back and forth from the home menu and the story just because they can! Be sure to check it out and enter the giveaway found on the Touch Autism Facebook page. 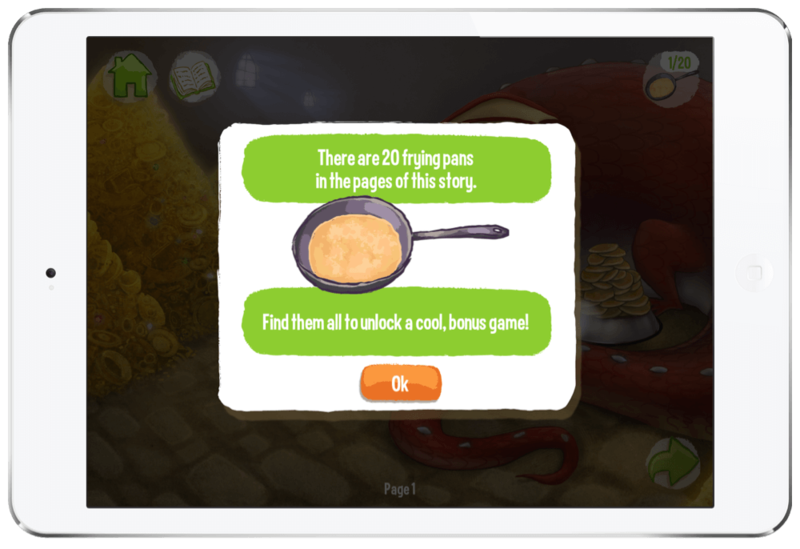 At the time of writing this review, Pancake Pandemonium retailed for $2.99 in the app store. 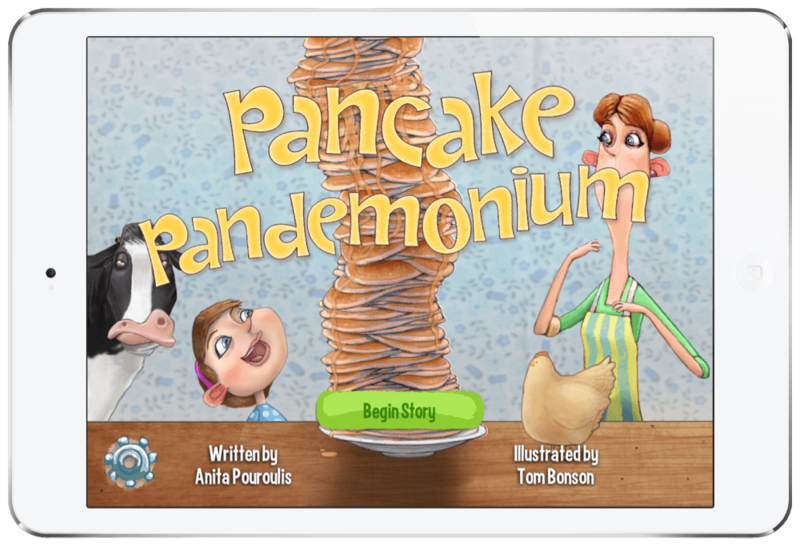 Download Pancake Pandemonium in the App Store today!